Stay Classy, Red Sox. I Mean It! Usually, when I use the “stay classy” line, it’s very much sarcastic. In this case, I actually mean it. The Red Sox and Mariano Rivera have a deep history that has featured many triumphs, and even a couple of big defeats, for the greatest closer of all time. While Rivera has been doing his going away tour, he’s gotten some great gifts, and some crappy ones, but I think he got the best one of all on Sunday night at Fenway. There’s a scene in Anchorman where Wes Mantooth, the villain rival anchor played by Vince Vaughn, says to Ron Burgundy, “At the bottom of my gut, with every inch of me, I plain, straight hate you. But dammit, do I respect you!.” That’s what was going through my mind throughout the ceremony. The Red Sox organization, Mariano’s greatest rival, showed that sometimes there are more important things than what goes on on the field. I mean seriously, the Red Sox definitely went all out. Before this, I thought the best thing Rivera had gotten on his tour was the rocking chair made of broken bats that the Twins had made for him, but this might have topped it on pomp and circumstance alone. First of all, it kicked off with the Boston Cello Quartet, who played “Enter Sandman”(for those of you living under rocks, that’s the song Rivera comes out to), which really set the tone for the all-class ceremony that was to come. As you can see in the video above, the Sox, like everyone else, presented Rivera with some gifts. 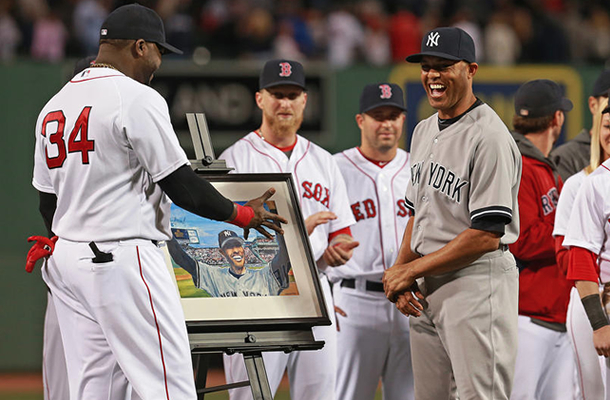 The first was a painting of Rivera presented by David Ortiz himself. The second was the green 42 placard that the scoreboard operators use whenever he pitches. It was signed by the entire team. Those would have been enough, but the Sox really went all out. They gave Rivera an original seat from the stadium (with the number 42 on it) that dated back to 1934, and even the pitching mound from the bullpen! Think about that for a minute. The Sox gave pieces of their stadium to an opposing player! How gracious is that? That’s stuff that they’re supposed to do for their own legends, not a member of their most hated rival. They did tease Rivera a bit by showing the video from the 2004 ALCS (let’s not talk about that), but it was definitely all in good fun, which is how Rivera took it. The Sox then all lined up and shook Rivera’s hand and, of course, Big Papi gave Mo a big ol’ bear hug, showing that, despite how much i hate him on the field, he really is one of the classier players in all of baseball I don’t know if all the Sox deserved to be there for that part (cough! cough! Lackey! cough! COOOUUUUGH! ), but it was classy none the less. Anyway, my Sox hatred aside, I really was very impressed. For a team to honor their greatest rival like that was touching. It also speaks to just how good a person the great Mariano is. I know that other stars, like Chipper Jones, have had these farewell tours, but this tour Rivera has been on has been amazing. I think it tops all of the others. Of course, I could just be being biased. Thank you, Red Sox. This almost makes me not want you to lose in the first round of the playoffs…. almost.